Office of Policy and Management Secretary Melissa McCaw answered questions Tuesday from lawmakers. Gov. 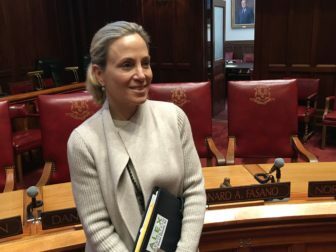 Ned Lamont’s new budget director, Melissa McCaw, deftly maneuvered through a series of political landmines Tuesday in one of her first appearances before the General Assembly. While pledging to be an open and transparent partner with legislators, the former Hartford budget chief fielded questions about the capital city bailout, which state taxes might be on the rise, Connecticut’s fragile relationship with its hospitals, and economic class warfare. “I’ve been in the trenches and I’ve been on the front lines, and I am confident that with almost two decades of experience we can work with the General Assembly to craft long-term solutions to the state’s budget that will stabilize our finances and facilitate economic growth,” McCaw told the legislature’s Executive and Legislative Nominations Committee. Lamont’s nomination of McCaw as secretary of the Office of Policy and Management was one of his first appointments after the November election. 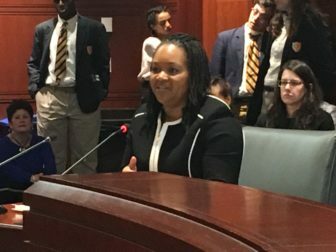 Though McCaw, 39, has 17 years of fiscal experience, including seven years as a state budget analyst in the 2000s and another seven as budget director for the University of Hartford, her last job before her current role — overseeing Hartford’s finances — drew considerable attention Tuesday. Republican lawmakers pressed the Democratic governor’s nominee for her take on the 2017 state bailout of Hartford — a long-term deal which legislators from both parties insisted went way beyond what the General Assembly intended. Legislators insisted they intended to channel a total of $40 million in extra aid to Hartford over two fiscal years. But in early 2018, Gov. Dannel P. Malloy and then-state Treasurer Denise L. Nappier signed a deal through which the state will pay off the entire principal on Hartford’s general obligation debt, about $534 million, over the next two or three decades — as well as an undetermined amount of interest. But how much aid would McCaw recommend, as state budget director, if another municipality is at risk of bankruptcy as Hartford was? asked Rep. Chris Davis, R-Ellington. “There is no one-size-fits-all solution to any municipalities’ financial struggles,” McCaw said, before quickly adding two qualifiers. And if emergency aid is necessary, she added, the Lamont administration and the legislature must be partners in that process, from start to finish. Fasano raised a different controversial subject, saying the Malloy administration badly fractured Connecticut’s relationship with its hospitals through tax hikes, mid-year reductions in state payments to hospitals, and an ongoing dispute over how those payments are calculated. 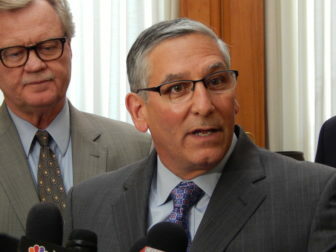 Fasano said some hospitals could be shortchanged by as much as 26 percent this fiscal year. “To have a fresh start you have to have good faith,” he said, pressing McCaw for assurances that her office would resolve the disputed payment calculations before proposing any changes to the hospital tax or other policies affecting the industry. McCaw noted the administration began its work just one month ago, and is required by law to submit a two-year state budget plan to lawmakers in 15 days. And while the payment dispute “is on the top of our priority list and conversations are ongoing,” the budget process — including the administration’s proposals for the hospital provider tax system — cannot stop and wait. 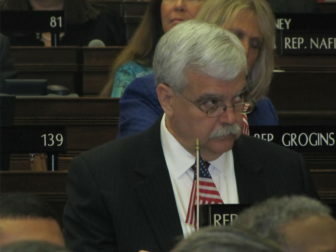 Republican lawmakers tried to get a sneak peak of that budget, asking McCaw whether it would involve tolls, cuts to social services, or tax increases. Lamont said during the campaign he only would support tolls on trucks, but he since has been pressed to consider a broader plan. “The governor has not finalized his position,” McCaw told Rep. Jason Perillo, R-Shelton, adding the goal is to build a Special Transportation Fund that can finance key transportation projects and remain in balance. As for cuts to social services: “I’m not going to show our hand,” McCaw replied initially, before adding the administration might seek to curb costs by building on efforts to reduce pharmacy expenses through auditing and quality control. She was equally noncommittal about tax increases, saying the administration has been researching options to broaden the sales tax base and reduce the overall sales tax rate. “I’m not able to comment on that at this time” McCaw said. The new budget director was definitive, though, when it came to the state’s faltering PILOT (Payment In Lieu Of Taxes) grant. This program, which reimburses communities for a portion of revenues they lose because state properties, nonprofit colleges and hospitals are tax-exempt, has been whittled down by legislatures for a decade. Could that all be reversed in Lamont’s first biennial budget? Perillo asked. “That is a challenge I do not see how we could overcome” in just two years, McCaw replied. But it wasn’t just Republicans who had tough questions for McCaw, who found herself caught in an economic class debate between two Fairfield County Democrats — Rep. Bob Godfrey of Danbury and Sen. Alex Bergstein of Greenwich. McCaw assured lawmakers that the Lamont administration is committed to bringing all interests together to solve Connecticut’s fiscal challenges.